Over the centuries, great men (and I trust women) of letters have been inspired by nature, the seasons and the elements to craft verse and fiction. One reason perhaps: There was not much else to do before Facebook, Instagram and Twitter except look out the window and chronicle what was taking place outside. Following a walk home tonight in 9-degree weather and biting winds, I’ve spent the last several minutes trying to write a poem about this brutish, seemingly unceasing, possibly record-setting winter of 2013-14. Will warm weather be near? Although I was an English major, it’s apparent poetry is not my strongest skill from a literary perspective. But, I am proud of my accomplishments in the public relations arena and as a blogger. So, I’ve decided to switch gears and offer some thoughts and images on positive aspects related to the winter that (seemingly) won’t end. 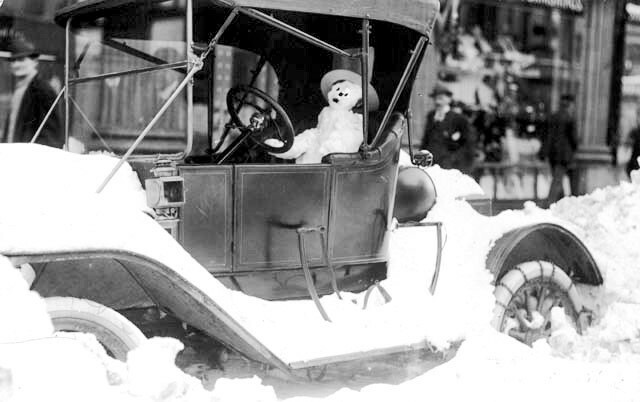 To my knowledge, no one in Chicago who was stuck in their car during a storm ended up like this guy. I’ll bet he doesn’t even have a CD player or GPS in that vehicle. Note the 5-foot high snowbanks adorning George Street on a sunny February day. Embed this image in your mind in August, when the air temperature reaches triple digits and there’s nary a breeze to cool you off. It might help. 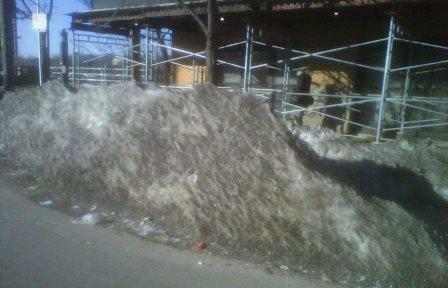 Some may view this mound of dirty, jagged, packed snow as ugly and disgusting. But look more closely: This is nature’s sculpted beauty! This is art! This could inspire poets! So there. My ode to winter in verse and images. Winter will end someday, but not anytime soon, as the weekend forecast calls for continued below normal temperatures and the possibility of snow — perhaps a lot. That’s okay with me. I’ll spend the time writing an ode to spring. Want more “winter” thoughts from the PRDude? 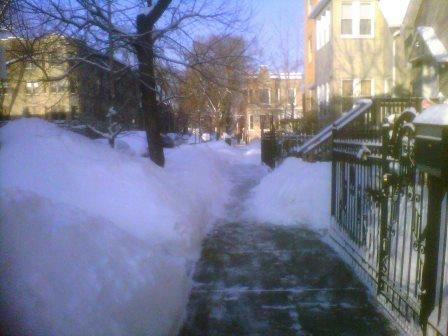 This January post offers some insight on what takes place in my home town of Chicago after a polar vortex pays a visit. In December of 2011, I paid a visit to Wisconsin and posted this travelog. And, “random thoughts” and some images taken during the famous Chicago “Groundhog Day” blizzard of 2011. As I write this post, the day after the 2012 St. Patrick’s Day “holiday,” I have a profound sense of a color besides Kelly green. I’m blue. Blue because the world as I see it is spinning on its axis in the wrong direction. Leaning too far to the left (or right), and not from a political perspective. Drowning in a sea of conformity and acceptance. Okay. Enough with the purposeful metaphors. Here in my hometown of Chicago and elsewhere, the multitudes “celebrated” St. Patrick’s Day, reportedly a day to honor the patron saint of Ireland, the guy who according to legend drove out the snakes a long time ago. I trust the snakes all drowned because Ireland is an island. Here we dye the Chicago River a rich green and thousands — reportedly tens of thousands yesterday — line the streets downtown for the St. Patrick’s Day Parade. And why not? We’ve had a long line of Irish mayors (Daley the First, and Daley the Second, most notably), global business interests with Gaelic names (Aon Insurance — “aon” means “oneness” and it was founded by a guy named Patrick Ryan) and plenty of pubs and restaurants named after Irishmen and women — real and imaginary. 1. The Commercialization of the Holiday. St. Patrick’s Day has basically lost any of its cultural heritage or significance. When was the last time you read about this guy from Ireland who chased out the snakes? Or about any of the leaders of the struggle for Irish independence? No, St. Patrick’s Day is mainly about drinking, using the holiday to hawk products or services and wearing something green. Note the graphic below for an example. The PRDude does not have reservations about any of these. Hey, I’m in public relations and marketing — communications disciplines that build relationships and promote things and services we need and buy. But this development is indicative of the way holidays have been denigrated into efforts to basically sell beer and trinkets. Think about it. We use dancing cartoons of Lincoln and Washington to sell mattresses; the Easter Bunny hawks chocolate eggs; Halloween has “evolved” from an opportunity for kids to collect candy from neighbors into a platform for adults to dress like zombies or the latest reality star. Don’t get me started about Christmas. 2. What’s Happening to the Weather? As I write this, it’s 74 degrees. Earlier today, the mercury climbed to around 80 degrees. It’s March, when we should be basking in 40 or 50 degree temperatures in the Midwest, donning raincoats and toting umbrellas around. This is not “normal,” and I don’t like it. Flowering bulbs that should be blooming in April are in full bloom. Magnolia trees that normally explode with color in April are now flowering. Turf is starting to grow. People are outside sunbathing! Here we just completed a “winter that wasn’t” and now have lost spring to early summer. The weatherman said we’ve set five new record highs for the month — and there’s still two weeks to go. Talk about March Madness off the basketball court. 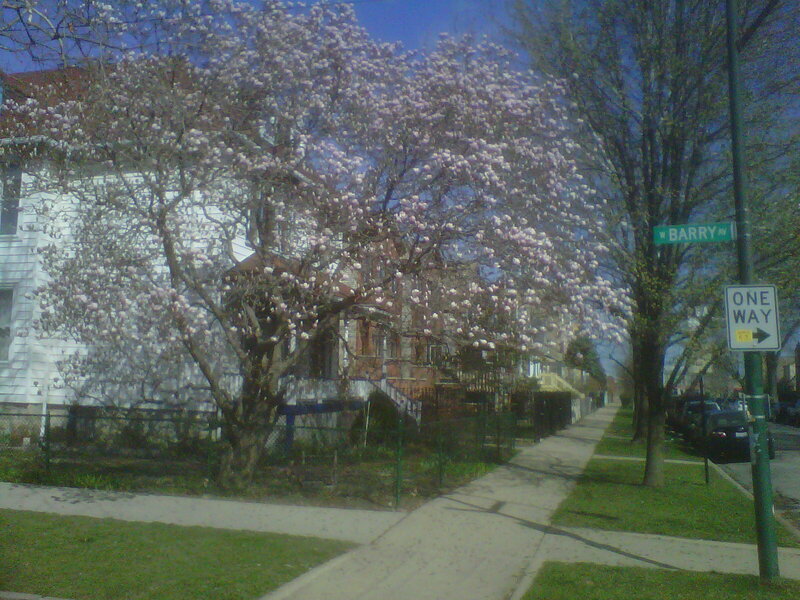 A magnolia tree in full bloom in Chicago's Avondale neighborhood on March 18. Our world is changing. And, maybe not all for the better. Sometimes, it’s beneficial looking back to the essence of a holiday or event that truly makes it meaningful, that truly gives it purpose. Sometimes the cold, wet and bleak days of March make us enjoy and appreciate spring and summer when it does arrive for good. There. I’m not as blue anymore.